Frederic Sackett was a close political ally of Herbert Hoover and, after a stint on the State Board of Charities and Corrections (1919-1924), he entered politics as a Republican nominee for the US Senate. One of his strongest political positions was his support for US membership of the Court of International Justice, the World Court, which, he argued, was one way to avoid war. Socially, Frederic and his wife were very popular and busy with memberships in exclusive clubs in Louisville, New York, and Washington. They visited London in 1924, travelling first-class on the liner Olympic and staying at the Ritz Hotel.6,7,8 They maintained two large homes, fully staffed with servants, “Edgecombe” in Louisville and a palatial home in Washington. “Popular and influential, the Sacketts were, in a word, a success.” (Burke). In retirement in Louisville the former senator and diplomat was able to devote himself to two of his greatest loves – agriculture and horses, which he continued to enjoy until his death of a heart attack while visiting Baltimore on May 18, 1941. Extracts from Ambassador Frederic Sackett and the Collapse of the Weimar Republic, 1930-1933. “Sackett did not aspire to become a diplomat. His election to the U.S. Senate in 1924 was the culmination of an already successful career in business and finance. At the age of sixty-one, he was content with his role in the national capital; but problems in Kentucky politics intervened to elevate his position even further to the realm of international affairs. The son of a wealthy wools manufacturer, Frederic Moseley Sackett, Jr., was born in Providence, Rhode Island, on December 17, 1868. He graduated from Brown University in 1890 and Harvard Law School in 1893, then moved west, first to Columbus, then to Cincinnati, Ohio. In 1898 he married Olive Speed, the daughter of James Breckinridge Speed, of a wealthy and prominent family in Kentucky business and politics. Sackett gradually abandoned the practice of law in favor of his wife’s family business interests, especially coal mining and related enterprises as well as real estate and banking. The Yankee proved to be a shrewd and skillful businessman who moved easily into the Louisville elite. 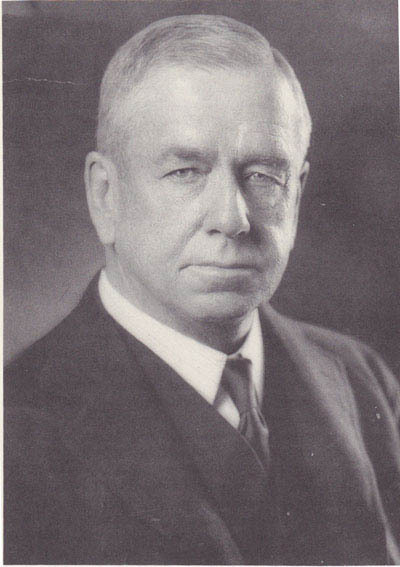 Named director of several businesses and banks, he became a member of the board of the Louisville branch of the Federal Reserve Bank of St Louis (1917-1924). His peers held him in high regard, prompting his election and re-election to the Louisville Board of Trade in 1917, 1922, and 1923. “A southern progressive, Sackett subscribed to the New South program of progress through rapid economic growth and industrialization in a diversified economy. An urban “booster”, he wanted to see Louisville grow bigger and better, but essentially a conservative, he wanted the transformation accompanied by continuity with the past. Like other southern progressives, he favored change and growth, but believed they should not alter the essential social structure or economic organization and civic leadership patterns that should remain constant. A well-ordered and stable society committed to ethical business practices could sustain the kind of unity necessary to economic development accompanied by social and racial stability. “Taking part in civic affairs and other varied activities, Sackett won a widely recognized reputation as a moving force in Louisville and a man to be reckoned with in the state of Kentucky. A staunch Republican, he was involved in politics from the time he first settled in Louisville until the end of his career. In 1917 he became federal food administrator for the state of Kentucky, giving him control of the distribution and rationing of food throughout the state. The position brought him into frequent contact with the head of the national agency, Herbert Hoover. A close political relationship developed, and later, when Hoover revealed his presidential ambitions, Sackett was among the first to work for his nomination and election. After a stint on the State Board of Charities and Corrections from 1919 to 1924, Sackett entered politics in earnest as the Republican party nominee for the United States Senate. “Opposition newspapers allowed that the Louisville businessman would “make a good United States Senator”. Sackett had won the support of a “considerable number” of Independents who “admired his character and ability”. The newspaper’s single regret was that Sackett was “a rock-ribbed conservative”. Another opposition newspaper acknowledged their admiration for him and aptly characterized him as “eminently successful, reasonable but not hungrily ambitious”, and as a “wholly satisfactory representative Kentuckian of the modern type, the type that does things rather than the type which talks, very beautifully, of past things done”. “After his election, Sackett moved quickly into the higher councils of the Republican party. A close friend of Secretary of Commerce Hoover, he worked quietly, and mostly behind the scenes, first with President Calvin Coolidge, and then President Hoover. On the whole, Sackett was a reliable supporter of Republic party positions. He was not noted for taking strong positions, or for seeking public attention. In fact, he was not an important force behind legislation. He did play a significant role in party politics as chairman of the Republican steering committee, which guided legislation through Congress, and as a member of the powerful Senate Finance Committee. “Among the strongest positions he took was his support for American membership in the Court of International Justice, the World Court. There was strong opposition in the Congress and President Hoover did not pursue the issue with enthusiasm. Sackett was more ardent on the subject than the president and spoke out against an attempt in the Senate to “emasculate the protocol” and obstruct American participation. He explained to a constituent that he felt the court’s “influence for good should be very great”. Acknowledging his “great sympathy” for the international tribunal, he argued in the Senate that the court was one way to avoid war. “Sackett’s support of the World Court did not place him at odds with Hoover policy, but the conservative, business-oriented senator took several unorthodox stands that must have concerned administration officials. He took a strong antitrust stand in the Senate, a position neither Coolidge nor Hoover favored while Sackett was in the Senate. Sackett deplored the growth of huge combinations, which he maintained were in violation of the Sherman Antitrust Act. Gigantic business organizations created by mergers and the development of powerful holding companies, he believed, should be subject to the full application of the Sherman Antitrust Act to halt what he saw as a pernicious growth. Sackett argued that there had developed “dangerous creatures of the new wealth” who were operating in the business world without adequate legislative restraints”. “While Sackett was still in the Senate, he and his wife, a childless couple, were most visible in the capital’s social life. They were very popular and busy with memberships in exclusive clubs in Louisville, New York, and Washington. They maintained two large homes, fully staffed with servants - “Edgecombe” in Louisville and a palatial home in Washington. In a word, the Sacketts were a success. Popular and influential, they had no other ambition than to return to Washington for a second term and resume the social and political roles that suited them so well. “This book details a striking political relationship between American Ambassador Frederic Sackett and German Chancellor Heinrich Bruning and their attempts to save the Weimar Republic, achieve German nationalist goals, and thwart Adolf Hitler’s drive to power. Sackett thought that financial policy was at the heart of German problems and, unless resolved, could be the basis for Hitler’s success. He was critical of the American corporatist policy that encouraged American bankers in the private sector to loan large amounts of money to the Germans. Sackett believed this policy was partly responsible for the German financial crisis and attempted to remedy it. Very early in his tenure in Berlin, Sackett saw Hitler and the Nazis as a serious danger to the Weimar Republic and to peace in Europe. He considered Hitler a political agitator and demagogue who was not fit to govern Germany. Imbued with a strong aversion to communism, the American ambassador thought that misrule by incompetent and inefficient Nazis would pave the way for a communist state. Although at first he saw the Nazis as harbingers of worse to come, in time he came to see Hitler as the real threat to democracy in Germany.”. Frederick M. Sackett, Jr., ... lawyer, ... was educated at Brown University in Providence, R. I., and received an LL. B. degree from Harvard University in 1893. He practiced law in Columbus, Ohio, from 1893 to 1897. In year last named he moved to Louisville, Ky., where he has since been engaged in the practice of law and development of various bituminous coal interests. In 1907 he was vice-president of the North Jellico Coal Company of Kentucky. Bernard Burke, Ambassador Frederic Sackett and the collapse of the Weimar Republic, 1930-1933, Cambridge University Press, Cambridge (1994), 297. "Historical Newspapers, Birth, Marriage, & Death Announcements, 1851–2003", digital image, Ancestry.com, The Hartford Courant, Connecticut, 19 May 1941. Andrews Newspaper Index Cards (England), digital image, Ancestry.com, "Re Frederic Moseley Sackett deceased. In pursuance of the Trustee Act 1925 All persons having claims against the estate of Frederic Moseley Sackett late of Louisville County Jefferson State of Kentucky in the United States of America who died on the 18th May 1841 and to whose Estate Letters of Administration (with the Will) were on the 29th day of May 1942 granted out of the Principal Probate Registry to Guaranty Executor & Trustee Company Limited the lawful attorney of the Executor named in the said Will are requested to send particulars thereof to us the undersigned on or before the 12th day of August 1942 after which date the Administrator will proceed to distribute the assets having regard only to claims of which notice shall then have been received. Dated this 2nd day of June 1942. Warwick Williams & Marchant 23, St. Swithins Lane, E.C.4. Solicitors for the said Administrator." "England & Wales National Probate Calendar (Index of Wills & Administrations) 1858–1966", digital image, Ancestry.com, "Sackett Frederick Moseley of Louisville Jefferson Kentucky USA died 18 May 1941 at The Lord Baltimore Hotel Baltimore Maryland USA Administration (with Will) (limited) Llandudno 29 May to Guaranty Executor and Trustee Company Limited attorney of Fidelity and Columbia Trust Company. Effects £105 18s. 1d. in England." Olive Sackett, 54, wife, USA citizen, Olympic 1st class, arr. 29 May 1924 Southampton, from New York, UK address Ritz Hotel, London, last permanent residence USA, intended permanent residence foreign country." Olive S Sackett, 60, housewife, USA citizen, President Harding cabin class, arr. 29 Jan 1930 Plymouth, from New York, UK address Amer Embassy, last permanent residence USA." This voyage was probably the first leg of his move to Germany to take up his duties as American Ambassador there. It would appear that he visited the American Embassy in London, presumably for further briefings.